Back in 2007, I reviewed MiniMail, a clever utility that lets you shrink Mail’s main window down to a tiny version reminiscent of iTunes' mini controller. This downsized window shows previews of incoming e-mail messages and lets you perform common actions on those messages, making it useful for keeping tabs on e-mail while working in other programs. While the latest version of MiniMail works well in Mac OS X 10.6.5, there’s a similar—and free—alternative, Herald, that some people may prefer. Like MiniMail, whenever new messages arrive, Herald’s floating window lets you preview those messages. However, unlike MiniMail, which is essentially an actual Mail window—meaning that if you hide Mail, the MiniMail window is hidden, as well—Herald’s message-preview window can stay on the screen at all times, even if Mail itself is hidden. One minor complaint I have with Herald is that when you “acknowledge” the last newly received e-mail message, the Herald window disappears, and it doesn't reappear until another new message arrives. This makes sense, as you’ve dismissed Herald to get back to what you were doing, but it still feels as though you've “lost” the Herald window. I’d personally prefer an option to keep Herald’s window visible unless I specifically close it. Similarly, I wish Herald would let me skip over a particular message without being forced to "triage" it right then and there. Herald doesn’t offer as many features as the $13 MiniMail, but if you mainly want a way to get useful message notifications and basic message-handling features, Herald is a good free alternative. 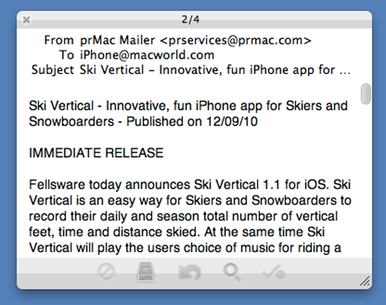 Herald lets you monitor incoming e-mail messages while you work in other programs.